China is very strict about censorship, which makes it difficult for companies to launch their products in the country. But companies like Microsoft are playing smartly to target the largest market in the world. 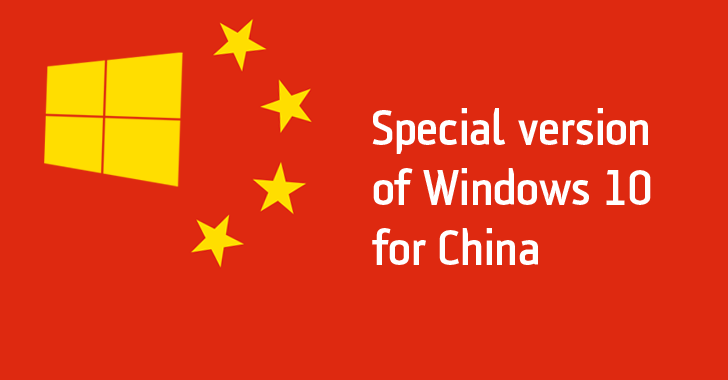 Microsoft has found a way to enter into the banned Chinese Market, but this time with official support for Chinese Government through a new custom and exclusive Windows 10 version for China. It sounds like Microsoft has no issues like Apple, which strongly refused the court order to create a special ‘GovtOS’ version to help the Feds with unlocking iPhone. Microsoft’s CEO for the Greater China region Ralph Haupter has confirmed that the company has built a Chinese government-approved version of Windows 10 OS that includes “more management and security controls” and less bloatware (pre-installed apps). In a joint venture with a state-run technology and defense company, CETC (China Electronic Technology Group), Microsoft developed its specialized version of Windows 10 to comply with governmental standards. The codename for the exclusive version of Windows 10 for China is called "Windows 10 Zhuangongban," which means "Specialized Class." The customized version of Windows 10 would come with basic apps and additional integrated privacy standards which could be a trust gaining strategy by Microsoft among Chinese nationals. The initial stern action of Chinese Government to ban Windows from the Chinese desks was the outcome of discontinued support of Windows XP officially by Microsoft. Moreover, the company enforced its XP user base to switch to Windows 8. According to the survey of Net Applications, a US Based Analytics firm, it is reported that 51% of the Chinese users relies on Windows 7, whereas 32.9% users are still relying on the Windows XP, a discontinued product. There had been made various efforts made by Chinese Government to build the counterpart of Windows XP called Neo-Kylin. But as the new player is in its infancy, it failed to grab the market attention as it lacked in the technical support. As no other options left, Chinese Government finally convinced Microsoft to team up with a local technological company (CETC) to build a new OS, and Windows 10 Zhuangongban is the result of the same. Microsoft’s goal to install its newest Windows 10 OS on one Billion devices worldwide is not possible without covering the largest market in the world. Convincing Chinese Government to adopt its Windows 10, even if it is a customized version, is a great achievement for Microsoft, which would help the company reach its 1 Billion goal soon. China, being the largest populated country in the world is a golden egg client for Microsoft to broaden the Windows 10 market base. With the Windows 10 Zhuangongban OS, now let’s see: Which Nation would be the next target for Microsoft to play the same move in order to reach its goal? Will it be Germany or Russia? ?